What I like most about Linux is its powerful command line. Many people find it intimidating, but with a little practice, the command line is the most natural way of interacting with a computer. Things can be done with the command line in less time than it takes to just launch the equivalent GUI utility. The term "command line" naturally doesn't invoke a very pleasant image because we have come to associate it with a bland, colourless screen filled with text. But in reality, things can't be more further from the truth. X based terminal utilities allow a variety of customizations to tweak the appearance to fit the user's needs. It's well worth the effort to spend some time tweaking the terminal to fit your taste, because sooner or later, you are sure to come across a task that is more easily accomplished using the command line than the GUI. The ability to tweak the prompt in interesting ways to display important information in various colours. 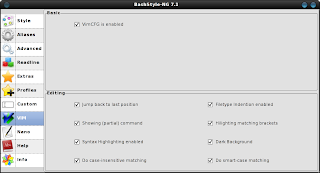 Installing BashStyle-NG is quite easy. Grab the source tarball from http://freshmeat.net/redir/bsng/75809/url_bz2/BashStyle-7.1.tar.bz2 and configure, make and make install ! BashStyle uses the python-psyco compiler to speed up execution times. It's a good idea to install it before beginning the actual installation. On my machine, BashStyle-NG got installed with root as the owner. This prevented some of the customizations from working correctly when run as a normal user. To fix this, change the permissions of the BashStyle-NG script. Now all that's left is to invoke BashStyle and start customizing ! Great man, can't wait until to chek it out. But Hav to wait until the evening.